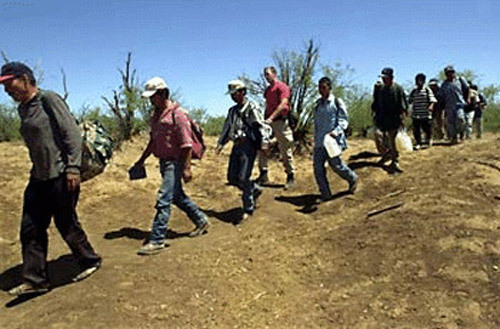 As Senators Weigh Immigration, Obama Has a Backup Plan - Integration Through Media ....! By MICHAEL D. SHEAR, WASHINGTON (NY Times): President Obama’s chief of staff said Sunday morning that the administration has privately drafted an immigration bill so they can “be ready” with a proposal if lawmakers ultimately fail to agree on their own version of an overhaul of existing laws. But Denis McDonough, the president’s top White House official, said Mr. Obama’s aides are continuing to work with a bipartisan group of senators despite harsh criticism Saturday night from a key Republican after a newspaper reported what it said were details of the administration’s immigration plan. USA Today reported on Saturday that early drafts of the White House legislation call for immigrants to wait eight years before becoming permanent residents. The report drew a scathing response from Senator Marco Rubio, Republican of Florida, who said the plan would be “dead on arrival” in Congress. “It’s a mistake for the White House to draft immigration legislation without seeking input from Republican members of Congress,” Mr. Rubio charged in a statement late Saturday night. The White House has declined to confirm the paper’s report, and Mr. McDonough did not say what specific proposals are in the president’s legislation. But he said everyone will find out if lawmakers can’t reach an agreement. The USA Today report said that the president’s draft legislation would allow illegal immigrants to apply for a “Lawful Prospective Immigrant” visa before they became eligible for permanent resident status. Those details are similar to the statement of principles that the White House provided to reporters after Mr. Obama’s Las Vegas speech. A fact sheet said the president wanted to strengthen border security, provide “earned citizenship,” streamline legal immigration and crack down on employers who knowingly hire illegal immigrants. “It would actually make our immigration problems worse,” he said. Mr. Rubio has been among the leading Republicans pushing for a comprehensive overhaul of immigration. Senator Charles E. Schumer, Democrat of New York, said Sunday that Mr. Rubio is “upset” by the reports of Mr. Obama’s immigration plan. But Mr. Schumer said he remains optimistic about the chances of reaching a bipartisan agreement by sometime in March. But Demetrios G. Papademetriou, president of the Migration Policy Institute, an independent nonpartisan research center in Washington, said the eight-year temporary status for illegal immigrants in the document obtained by USA Today was “essentially the same as the probationary status” envisioned in a proposal developed by a bipartisan group of eight senators. During that probationary period, Mr. Papademetriou said, immigrants would have temporary visas with full work authorization. The bipartisan Senate proposal calls for additional border security and more effective enforcement to curb illegal immigration. And it would require that “enforcement measures be complete before any immigrant on probationary status can earn a green card.” It was not immediately clear whether the White House would support such linkage. Mr. Obama’s administration has been working on immigration legislation for years. But the issue shot to the top of the president’s second-term agenda after his re-election in November, when Hispanic voters backed him in large numbers. White House officials are betting that Republicans will be eager to embrace immigration changes as a way of repairing their image with an important voting bloc. But getting legislation passed remains tricky, especially in the Republican-controlled House, and Mr. Obama has made it clear he will take a back seat to lawmakers if it will help. Negotiations are taking place among a bipartisan group of senators, a separate group in the House, and labor leaders and the U.S. Chamber of Commerce. On Wednesday, the White House said Mr. Obama met with Democratic senators at the White House to get a status report on the pace of progress on the legislation. In a statement after the meeting, White House officials said the president reiterated his pledge to become more involved if necessary. It remains unclear how long the president is willing to wait. In interviews with Spanish-language television stations after his speech last month, Mr. Obama suggested that he wanted to see real progress by March, when lawmakers had said they hoped to have reached an agreement.